Check out the SensorFreshQ meat smeller. 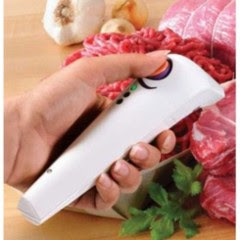 Running on two AA batteries, you simply point the device at your funky smelling meat or poultry and it tells you after about a minute if you should eat the meat. It does this by sampling the air around the meat and somehow detecting gas caused by flesh-eating (kidding!) bacteria. The results of this electronic sniff are in the form of a Red, Yellow or Green light. Retails for $89.99 and is available for purchase at Amazon.com among other stores.